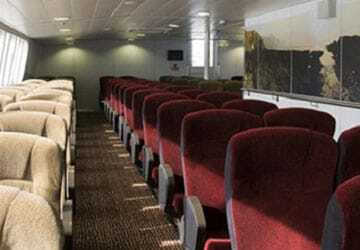 a variety of seating areas, including two cinema lounges, a large café bar area at the stern and the a café. There are no cabins however there are 2 lounges. In the Premium lounge on the Manannan you’ll find all table seating, complimentary non-alcoholic beverages, complimentary newspaper and magazine selection, access to laptop and mobile phone charging points, pillows and blankets are also available on request. Children under 8 years are not permitted in to this lounge. The Niarbyl reserved lounge is a comfortable and spacious seating area and offers peace of mind on busier sailings as it guarantees that you will have a pre-assigned seat booked. Children under 8 years are permitted in to this lounge. When it comes to eating and drinking, the Manannan offers something to suit every age and taste with a range of food outlets in a relaxed and enjoyable environment offering a wide selection of food and drinks. In the Manannan onboard shop you'll find everything from a newspaper or magazine to the latest fragrances and there are some great bargains to be found too. Please Note: Whilst we have taken great care in making our Manannan guide as accurate as possible, onboard facilities, services and entertainment may vary depending on the date and time of year that you travel, facilities mentioned may change without notification and ferry companies reserve the right to operate vessels other than those mentioned at time of booking without prior notification. Crew very pleasant and helpful. Seats comfortable. Good refreshments. Smooth car parking. However inevitably due to choppy seas there was a lot of sickness. The food that my friends ate looked delicious. A very comfortable crossing to and from the Isle of Man. The outward journey was extremely busy but staff were very helpful in finding seating and and gave great service, cheerful at all times. Very comfortable crossing, staff helpful and pleasant,I would use this service again if I needed to cross to the Isle of Man again.We did not use the catering service so cannot comment on that. 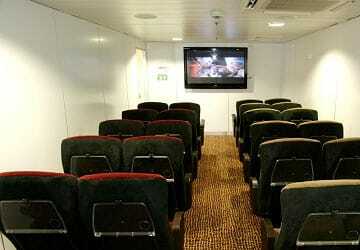 "Travelling to Isle of Man"
Clean boat, and left on time and a room specifically for pets. It was a very easy trip to make. Great experience. My son thoroughly enjoyed it. A quick and calm crossing both ways. We where in the Isle of Man for the TT races and my friend had mobility problems and I changed our ferry trip from the Saturday to the Friday one that goes direct to Liverpool instead of Haysham Port. So glad I did as I had a little accident and was on crutches also. The staff on the ferry where great and helped us to our seats. Excellent service which we used for the first time-beats flying every time. We went for our daughters wedding and our guests used Liverpool or Heysham and were all impressed with the service. I used this service to go to the Isle of Man and was very pleased with the fast cat and the facilities I would recommend this company to everyone!! 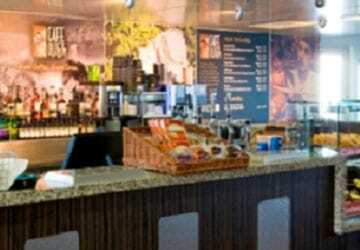 I Would definitely use Steam Packet again as the staff are friendly and efficient. Everything run smoothly. Thank you. Great trip sailing on time both ways and pleasant crew and helpful staff on board. Return from Douglas getting baggage back needs a bigger space, otherwise every thing perfect. "Our Ferry crossing too and from the Isle of Man"
Fast and comfortable crossing ,fully informed of progress, well directed getting the car on and off the ferry helpful staff. Our trip went very smoothly, boat was a bit late but that wasn't a problem for us. Onboard facilities were good, we watched a movie, had to tell some other rude passengers to stop talking so we could hear the movie, but that was not the fault of Steampacket. 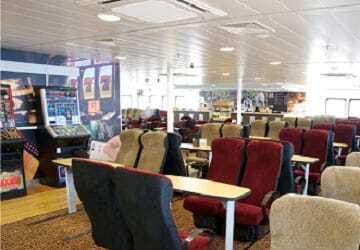 A great and friendly service on board the Steam Packet. "Steam Packet Fast Cat Liverpool to Isle of Man"
The fast cat from Liverpool to Isle of Man was on time, very clean and very comfortable. 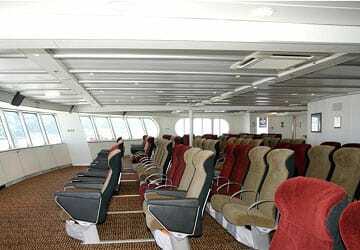 There are lots of seats around the ship. 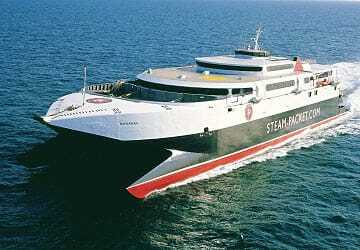 Leaving the Isle of Man, the fast cat schedule had changed due to an engine problem. We were never informed of this by e-mail. Luckily we heard about it whilst on the island so we didn't waste the extra 45 mins delay. The sailing time was also extended so if you were catching a train it would have been a problem. "Great crossing, no problems whatsoever." The ship was punctual, clean, and fast; and the crew were helpful, polite, and cheery despite the early hour of the crossing (which is the only downside to the crossing in my view: with a 7am departure and the check-in 60 minutes prior, the crossing is made somwhat inconvenient, particularly for visitors situated outside of Douglas). No problems whatsoever with the crossing: the ship was punctual, and the crew were friendly and helpful. The ship was clean and fast, the only possible downside I can think of is that the frequent security announcements (however necessary) momentarily interrupted the FIFA world cup game currently being shown on the many screens on board - in no way a big issue! "Belfast to Isle of Mann and Isle of Mann to Liverpool"
Fortunately very calm seas both journeys, but happened to be on same boat both trips which meant I could not watch a film on both trips as one cinema was "out of action" and in the other the same film was shown on both journeys - a bit annoying when you want to watch a film to take your mind of your usual sea sickness. Otherwise boat OK, food being served looked OK and everything clean and comfortable.